That’s what a potential client told me on the phone recently. She was already blogging regularly, getting pretty good traffic to her blog, lots of likes and shares on Facebook — but it wasn’t translating into sales for her. She felt like she’d done everything she was “supposed” to do to blog for her business, but something was missing: that integral piece of strategy that connects blogging to selling. In other words, she wasn’t planning her blog post content to support her sales cycles. Now, that’s if you’re using a launch cycle, which are so popular on the Internet. But sales cycles also apply to businesses with evergreen products and services. A great example of a business with strong sales cycles is a tax professional. She knows that from January – April, she’s going to be CRAZY busy helping people do their taxes. But there are probably also other parts of her service she can promote at other times of year. I worked with a personal stylist recently, and because of the way the fashion world works, she could easily predict that she would have strong sales in the spring and the fall, when new lines come out. But we could also build additional sales cycles for her — maybe shopping the sales in the summer and winter, organizing closets in the spring and fall, planning for special occasions like weddings in June and holiday parties at the end of the year, and so on. 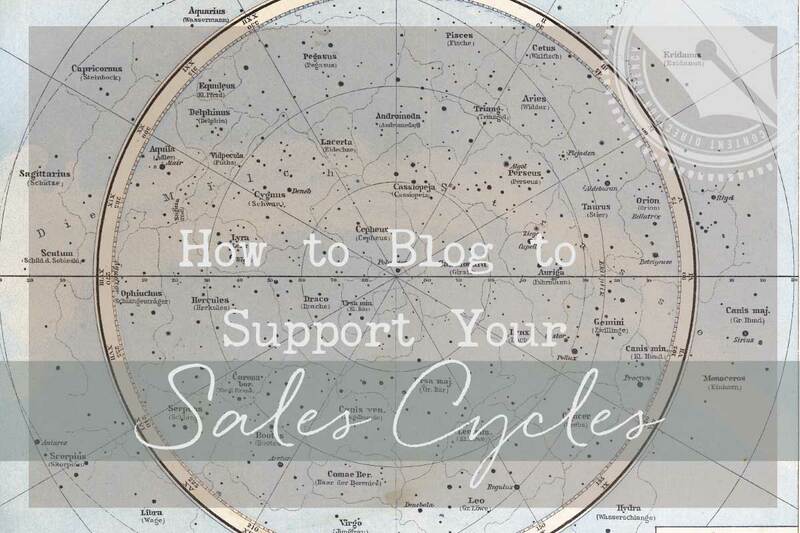 Once you understand what your sales cycle is, you can easily build your blog posts to support and promote that cycle. How to use your blog to launch a product or service. The big thing to remember is that MOST people are not going to buy something straight from your blog. So the blog is the first step in your marketing “funnel.” <— That’s just a jargony term to describe how you’re going to lead people to purchase. This is a complex concept, and something I’m actually developing a higher level program to teach AS WE SPEAK! You can check out this post about the hierarchy of audiences for more on the idea of funnels. When I’m planning out an editorial calendar, I like to put blog posts into a sequence that leads people to a purchase. It’s called AIDA and stands for Attention, Interest, Desire, and Action. I’ve got a list of 201 ideas to put the AIDA formula to use for your blog. Download this list for free by clicking here. In an ideal situation, you start maybe six weeks before your launch with a big Attention-grabbing post; this should be something that challenges their assumptions and grabs onto them. It’s also great to promote your opt-in here, or a content upgrade (which is smaller opt-in that goes with just that post). The idea is to get as many eyeballs as possible on your blog and get as many people as possible opting in. Plan to promote this post HEAVILY. You might even do two big attention posts back to back if you can swing it, or one on your blog and a guest post somewhere else. The goal is LOTS of people seeing this post and opting in. Next you want to do a series of Interest posts; these are going to hold your readers’ interest and make them want to keep coming back for more. You want to expand on the ideas you were challenging in your attention post, analyze WHY your method/product/ideas are different, and really give them a taste of what your product is all about. In these posts, you’re going to sprinkle in priming phrases that get people comfortable with the idea that you’re selling something. You might say, “I go over this in much more detail in my upcoming course,” or “There’s just no way to teach all of this in a blog post, which is why I’m going to be offering one on one consults.” Etc. You want to end with a couple of posts that generate DESIRE for your product. Case studies are great for this, but you might also just write a post highlighting your own experience or asking them to imagine how different their life would be with your product. With ALL of these posts, your goal is to get people to opt-in, so you want to tie in your opt-in or a new (smaller) content upgrade at every possible opportunity. Finally, you can choose to write a post announcing your new product (which would be the ACTION part of the equation) or you can do that announcement through email. If you’ve set up your offer to be irresistible to your ideal reader, you should be good to go. You can also choose to REPEAT the sequence (AIDA) through your email during your launch period, writing new content that hits the same buttons. In this case, the final action email is probably a “Last chance! Cart closing!” sort of email. How to use sales cycles if you’re NOT launching a new product (evergreen products or services). With evergreen products and services, I like to go through the calendar and mark off big holidays and events that might tie in with your product or service: back to school, Christmas, Valentine’s day, etc. and start from there and work backwards. So, let’s say you have a product that kids might need for school, and you want to do a back to school push. You pick a date and work backwards. So on, say, September 1st, you’re going to have the “action” part of your cycle, suggesting they buy your product for the school year. From there, you work BACKWARDS to support that call to action. Two or three weeks before Sept. 1, you would be posting interest posts, educating your consumer on why the product is good for school. And the week before that, you would put together one or more big attention-grabbing posts, getting as many eyeballs as possible on your blog. Now, what do you do if those holidays are more than 6–8 weeks apart? Well, in those “down” times when you’re not “launching” something, I’d focus on producing more epic content: It could be a series of posts, an ebook, a webinar, an interview series, a single post… anything that hits all the requirements for an epic post. Courtnay: I noticed that if I label a Interest post then I ask myself what would be the Attention post I am getting even more clear on the progression and getting more precise ideas which will benefit my audience. It also makes scheduling easier. It really is a great strategy. Attention: signs your marriage is strained. Lacy: Sure! So what are you actually selling with this sequence? Just from the topics you’ve provided, I would suggest either a case study, showing how someone used your system to improve their strained marriage or a post that shows more generally how blissful life can be when one applies your strategies for living a strain-free marriage. Courtnay: Can you put the interest and desire content into one post? I was also thinking, if you set it up right, this technique makes your site really sticky. How to use sales cycles if you like to write timely content. Of course, not all blog posts are evergreen — and not everything can be planned out in advance. Another CIA participant, Jacquette, likes to take current events from the media and write about her perspective on them for her blog. She sells an evergreen service. She asked: How do you use sales cycles when you are a) promoting an evergreen service, and b) unable to plan exactly what you’re going to write about each week? First: put together a list of what I call “cornerstone content” that is evergreen, things people always need to know. Then, whenever you don’t have a current event to write about, you can pull out one of those topics as a backup. Second: Set out the AIDA cycle in your calendar. (If you’re blogging once a week, this works out well, because you move through the cycle each month.) You can still use current events to do the AIDA cycle, but you need to be able to remind yourself, “Oh, right, I need to be writing an attention grabbing post this week.” Each cycle is directing people to sign up for her evergreen service. As with any knowledge, it’s incredibly important for you to take action with it to solidify it in your brain. So how will you put sales cycles to work for your blog? Take a moment and let me know in the comments below: it’s accountability for you, and good examples for others! Stuck? Feel free to ask questions in the comments as well. I’m here to help. Hi Lacy! What are the best ways to promote a piece of content, other than emailing it to your list? 1. Share to social media. You knew that, right? 😉 But in addition to your own social channels, join some groups with your ideal customers that allow sharing. You can also join sharing communities like my group The Network to help get some more exposure. 2. Email anyone you mention or link to. Let them know that you’ve written about them, and suggest that they share it with their audience. Couldn’t hurt, might help! 3. Share it with sharing sites, like BizSugar or blog hops/roundups/circuses. Or find a way to repurpose it for sites like SlideShare, YouTube, or Stitcher. 4. Ask people who know and love you to share it. 5. Run a very targeted ad campaign on a social site like Facebook, Pinterest, or Twitter to specifically drive traffic to that post. I only recommend doing this if the post contains a very strong call to action to sign up for your email list. IN MY OWN CASE. FOR ATTENTION, I WILL BE DECLARING THAT AVATARS DON’T WORK. AND THEN PITCH MY BOOTCAMP IN A WHY I CREATED IT MANNER, WHATS AVAILABLE AND THE RESULTS PEOPLE CAN EXPECT. WHAT DO YOU THINK? Sounds great to me! Remember with evergreen products that the real trick is creating urgency, so think hard about why they need to invest NOW. Will think through that.I will tap into why they need a customer discovery system and the cost and consequences of not doing it now as the urgent element.